The State Primary elections are like reality TV shows, serialized competitions between “real” people to determine who is the fittest, the best at playing whatever game the TV producers have invented to represent the struggles of ordinary life. Donald Trump is a gift to the news business, a skillful pitchman who attracts attention because he has a captivating style of presentation and offers the prospect of victory over all of America’s enemies. The Donald’s success in the Republican State Primary elections is attributable to his understanding of levels of voter psychology that are so deep that most people can’t articulate them. For those who vote for him, he is a worthy champion for white Christian Americans who feel that they’ve been losing control of their nation to domestic minorities and foreign villains. We are wired for drama. Watching TV is like attending to a tribal elder retelling tales of glory around our village fire. To the conglomerated media companies, of which CNN and Fox are divisions within much larger enterprises, it’s all “content”. Drama, news and sports compel attention because they are adversarial: good vs. evil, us vs. them, strong vs. weak, skilled vs. inept, and so on. In this conception, State Primary Elections are highly salable content with a competitive structure and compelling characters whom we perceive as heroes or villains, else the stories make no sense to us. Certainly there are democratic reasons for the evolution of the State Primary system of selecting candidates. Undeniably, the process serves a vital need to identify politicians who can be effective leaders of our Federal Government. But it’s important to remember that the current Primary system evolved as part of a media ecology, symbiotically integrated with the development of electronic communications technologies and conglomerated companies with the financial resources required to develop and use them. The State Primary system is, therefore, a commercial domain. Our democracy is now at least as responsive to market forces as it is to democratic principles. For me, a romantic who deeply loves democracy, this is tragic. I want to elect statesmen, not hustlers. Donald Trump is a hustler. If you can bring yourself to watch him, notice how he uses language in his pitch. • Triples: Professional persuaders know that if you say something three times it is more compelling than saying it once, twice, or four times. It’s called “the rule of three” and is taught to sales professionals on the first day of class. • Short stories. Trump expressively explains every “issue” as the story of a person (like us) competing with “them”. • Sincerity: He has the confidence of a megalomaniac. Somebody as great as him can’t be wrong. He absolutely believes in whatever he’s saying. There were two surprises when I went to retrieve the newspaper from my front steps this morning – more snow and the results of the NH primary election. Wow! As much as I like Bernie, I didn’t expect him to do so well. A lifetime of election watching has conditioned me to view our process as a method of selecting the most acceptable, the least offensive candidate. Could it be? Is it possible that “the system” is flexible enough to effect significant change? My goodness. I might have to exchange my curmudgeonly pessimism for optimism. Trump’s win has a different significance, but like Bernie’s, it indicates, contrary to my cynical expectations, that the primary campaigns are actually democratic (small d). Trump is seen as the best option by a plurality of Republican voters. I was pleased by his decisive win. His victory suggests that traditional Republicanism may, at long last, be dying. The days of the money-driven, pro-business, worker-be-damned traditional Republican Party may be over. Trump’s candidacy may be the silver bullet that kills the GOP monster. No doubt, Hillary is a safer choice. All of us, Republican or Democrat, hope the candidate we choose is a good enough politician to effectively manage the changes he or she supports. I guess that’s the basic difference between HRC advocates and BS (how unfortunate) advocates. Clinton voters opt for someone who can be trusted to use the existing levers of power to move the boulder. The overwhelming majority of New Hampshire Democrats don’t believe in those methods anymore. They are so frustrated by the system, the status quo that the Clintons can manipulate so well, that they’re voting to change it. The age disparity between Clinton and Sanders voters can be interpreted as a greater willingness to take risks in younger people. As we grow older, we become more risk averse. I don’t disagree with taking a safer approach. Apparently, New Hampshire Democrats think our political problems are systemic, and that a vote for her at this stage is an endorsement of the system. Change is scary, but so is no change. A Jewish Social Democrat as President of the USA? Oy vey! It sounds absurd. Sanders’ candidacy could be as lethal to the traditional Democratic Party as Trump’s would be for the Republicans. Donald Trump. a blowhard pitchman as President of the USA, is an even more bizarre prospect, and more frightening. He is absolutely unqualified and dangerously egotistical. But there’s no doubt anymore that the status quo, the political equilibrium to which we have been accustomed, is tottering. The majorities in both parties are voting against the system. Are you appalled by the candidates? Have you dismissed “the campaign” as a reality show? Are you pessimistic about the prospects for reform? Do you believe that our system is corrupt? Are you more partisan than you have ever been? If you answer ‘yes’ to these questions, you are a typical American voter – welcome to the majority, the dominant political grouping of Americans. Our political troubles are systemic. The form of patriotism that I was taught in the Philadelphia public schools, way back in the day, was a democratic value system. It wasn’t about fighter jet fly-overs, or our troops, or flags as big as football fields. I was taught a democratic value system founded on notions of justice, equality, freedom, laws and the American spirit. I once was proud of that system. It wasn’t perfect, but it worked, in its cumbersome fashion. The system, our democracy, was once the best thing about America. But something seems to have gone badly wrong. Our political process has succumbed to market forces. Even now, as a few of us old school patriots grumble in the corners, the ability of a politician to pay for advertising has become required, as if fund raising is an essential qualification for office. Most of us accept the financial imperatives of the news/media/politics companies as sacrosanct, untouchable. But those companies produce the campaigns to fit the tastes of an audience, they shape the process, they dominate the system. The political parties have a symbiotic relationship to the media/news companies – they absolutely need each other to survive. But I don’t think audience share is a form of election. The courts need to be challenged to weigh our collective right to an ever-improving democracy against the right of networks to make a profit. We have come to believe that our only hope lies in changing the donkey to elephant ratio in Washington. That would work if the donkeys and the elephants were not creatures of the system. We are seduced by the personalities, as if elections are serialized dramas featuring our favorite celebrities. We have become captivated by the question of who’s going to “win”, as if politics is the same as a televised sport. For the purposes of the media conglomerates, politics, soap operas and sports are all the same – they’re content crafted to attract an audience. The more effective the programming in attracting audience share, the more shows they produce. Interest in the campaign is a sales opportunity. The news programs, besides informing us about who’s up or down, promote the campaign itself. The longer political marketing campaigns last, the greater the number of opportunities for commercial advertising. By the final month of the campaign, the viewership and the advertising rates swell to record levels – election after election. I would be really down in the dumps if I didn’t think there were solutions. There are remedies. Some of you are saying that that all would be well if we could only reverse the Citizens United Decision. The Supreme Court ruled, with reasonable justification, that spending money on political expression is a right guaranteed by the First Amendment. Candidates in both Parties have said they would favor a Constitutional Amendment that would counteract the decision, but none of them are clear about how it would be worded. Worse, the amendment process is sure to fall victim to partisanship. But that’s looking at the problem from the wrong end of the telescope. Yes, financing is a problem, but so are costs. Instead of concentrating all of our outrage on the financiers, we should also be looking at who’s getting paid. There are legal, Constitutional ways to regulate the media and to abbreviate the process. We must make the campaigns shorter – the longer they last, the longer the viewing season, the more incentive the media companies have to prolong the process. Congress has the right to set the dates of elections (Article 1, Section 4, US Constitution). The state primary elections for Federal candidates ought to be simultaneous. The costs of campaigning will shrink dramatically. The news/media/politics conglomerates have to be regulated, as any public utility. This includes setting maximum rates and dictating fairness of access and distribution. Electric companies and water companies are regulated this way because a civilized population requires reliable water and electricity. We need the media, but we need our democracy too. Back in 1994, Federal Communications Commission (FCC) legislation was passed that reconfigured the media/news/telephone/cable industry in a way that promoted conglomeration and greater corporate autonomy. In 1996, the FCC changed the “fairness doctrine” requiring broadcasters to provide equal time to candidates. The FCC, internally, decided that the fairness doctrine violated the First Amendment. That in-house policy has not been subjected to judicial review. Federal communications legislation has to be rewritten in such a way that our rights to a sane electoral process are protected from market forces. By the way, The Federal Elections Commission (FEC) is toothless, authorized to collect contributor data and little else. Cheer up. It will soon be Springtime – the snow will be gone, the flowers will bloom, and there will only be seven months remaining before the 2016 General Election. Hoping for good people to run for office is necessary of course, but it’s not a solution. I used to be one of those non-partisan voters who said he evaluated the characters running for office and picked whomever seemed most qualified. No more. Our system has become so badly skewed to favor wealthy Americans that systemic (Constitutional) reforms have to be put front and center. The popularity contest / reality shows that now dominate our politics are a disgrace, a symptom of the plutocratic syndrome, not a cure. The big news this year was Valerie’s bionic enhancement. They placed a ring of little magnets around the tube where her esophagus meets her stomach to assist tightening the sphincter against backflow, an unhappy condition of near constant heartburn from which she suffered for years. Now she’s even more perfect than she was before. She is warned, however, not to undergo an MRI, which could pull the little gizmo out of her middle like the Alien spawn. We wouldn’t want that. Our friends, Jen and Liz, announced their betrothal just weeks after the Supreme Court legalized gay marriage. We were privileged to have them choose our backyard to have their October ceremony. On a fine afternoon of great joy, the sun shone on the chrysanthemums, pumpkins and smiling guests. 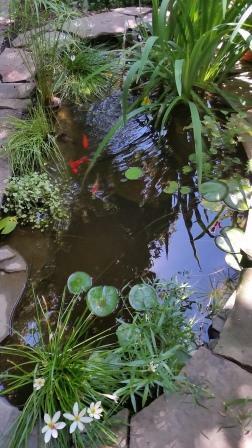 Another bit of joyful news concerns our serendipitous discovery of the benefits of pond gunk. Years ago, because we had a little bronze fountain sculpture that needed a water source, we filled a cement tray with water and stuck a little pump in it to drive the fountain. By 2015, we’d expanded and deepened the pond to a five by eleven hole in the ground, three feet deep. The goldfish love their expanded home and poop their little hearts out. The filter box through which the fountain water flows gets clogged with their product every few weeks. When life hands you lemons, they say, make lemonade. The contents of the filter box cause Valerie’s plants, including the lemon tree, to flower as never before. And how I do love lemon meringue pie. We took two trips this year, below our average, because of the surgery. But they were terrific: a road trip to join Valerie’s family for a summer holiday at Traverse Bay, and the other to sample the canyon country around Flagstaff with friends. I am pleased to report that the Grand Canyon is very grand indeed, and that Valerie’s magnets are undetectable by airport security scanners. I was busy for awhile building a new website/blogspot (www.stanleycutler.com), hoping that a pretty online presence would attract readers to my books. It turns out that I have to do a whole lot of tweeting and grunting on social media if people are to find the site, energies that I have so far been unable to muster. So the site sits there, unloved by everyone but me. I finished an espionage thriller called The Subversive Detective and a non-fiction book of essays on political rhetoric. The latter gave me material for a couple of courses that I now teach to old geezers, like me, at adult education centers. This is great fun, an opportunity for the geezers to vent and articulate their thoughts on matters political. I also contributed several articles based on the book to a local newspaper, but I’ve given that up for awhile. I might resume the series if I can overcome my aversion to the tweaking of editors. Betsy, our daughter, moved to Boston this year to take a better job – she does paralegal work in the field of international intellectual property rights. She likes Boston and is happy with the move. All good. Happy Chanukah, Merry Christmas, Drunken Solstice, Happy New Year! We hope that everything works out for you and yours in 2016. There is no excuse for murderous behavior. It ought to be dealt with immediately and with the full force of The State. Understanding motives is different from excusing the behavior. In Israel, there is a divide between those who have ceased to care about the living conditions of the Arab populations on the West Bank and in Gaza, and those who see their Arab neighbors as human beings struggling, as we all do, to improve their lives. The “political correctness” that some see as paralyzing calls for the government of Israel to craft more nuanced programs, to recognize the important moral distinction between “security first” and “security only” policies. Those who scorn “politically correct” messages view them as a source of paralysis. I see it as democracy. Recently, once such critic, Daniel Hartman, cited as an example of the paralyzing flaws of political correctness, John Kerry’s attempt to characterize the Paris attacks as “senseless” rather than as motivated by an understandable rationale . Similarly, many accuse the Obama Administration of softness because it chooses not to use the phrase “Radical Islam” in descriptions of the terror threat. The semantics could be called “political correctness,” a pejorative. Or one could call such usages “the language of diplomacy,” which recognizes the interplay of competing interests and the desire to defuse incendiary situations. Which would you prefer? Recently, Mrs. Clinton altered her stance on the terror threat by acknowledging the legitimacy of the phrase “Radical Islam.” I don’t think this shift is helpful in a policy sense. Rather, it is an attempt by her campaign to align herself with Jewish and Christian elements who see themselves as more American and morally superior by virtue of their religion. The reason I have drawn comparisons between the 1948 Presidential campaign and the current one is to better understand the crucial role of external, international threats in our democratic discourse. Politicians demonize “the other” because the rhetorical tactic is an effective way of establishing the moral superiority of the speaker. But there are dangers in employing such tactics in that they tend to reduce policy choices to the passive vs the aggressive. The sensible middle way, The Tao, is far less likely to be achieved. True statesmanship seeks to find the middle path. With its attacks on Paris, ISIS has triggered the war it wants. By defining itself as a unified government within defined borders – a state – it has achieved its objective of establishing a Sunni country under Sharia Law. Its amorphous predecessors had hidden under proxy governments in Afghanistan and Pakistan. Now, the West has a target and a casus bellum, a justification for war. By declaring war on the IS, Europe recognizes its statehood. To the fanatics in charge of the new state, the war will, at least for awhile, legitimize their movement in the bloody minds of the naive. A unified, militarized Europe will solidify the EU and NATO – if the USA is willing to provide leadership. Otherwise, the war effort may cause irreparable rifts in the European alliance. Russia’s involvement risks a different set of challenges, but perhaps opportunities for a united Western Europe to assert itself against Russian influence in Central Europe. The challenge is really Putin’s – how will he react to an EU fighting for the same geography south of Turkey? Is he willing to risk a Ukrainian Front? The United States is, once again, the indispensable nation. American capabilities will be essential if the war is to be won. American diplomacy will also be tested in directing the alliance, requiring a steadiness of purpose from the White House and Congress. Newt Gingrich taught Republicans that politics is a zero sum “game” in which any victory by the Democratic Party is necessarily a loss for them. Over the last 20 years, we have witnessed the development of a political environment dominated by the negative Republican Party, a Congress that does not compromise even as our environment, schools, social services, economy and international standing deteriorate.Their rock-solid opposition to a sensible international agreement is just the latest example of Republicans playing a zero-sum game, putting electoral victory ahead of the country’s welfare every time. Sad, isn’t it? Every new gadget or improvement separates me a bit farther from other human beings. It’s not just because I am a solitary writer working at home – our culture as a whole is dedicated to the personal. If I’m a salaried employee nowadays, I will probably drive alone in a car to a suburban parking lot and go to work alone in a cubicle. Commuting and working used to be group experiences. If I’m commuting on a trolley, bus or subway car, I’m in a group, part of a temporary community of people who all have the same purpose – getting to work or going home. Even though the group’s membership changes from stop to stop, we cohere around a shared interest in getting safely and quickly to our destinations. If I’m on public transportation, I notice the people around me – who’s sitting, who’s standing, what place should I take? I am physically just one among many. Nowadays, because I prefer to be alone in my car, I rarely use public transportation. And we are much more likely to work alone. Not so long ago in America, most people worked on factory or office floors, places where they could see co-workers. Open offices are long gone, replaced by spaces partitioned into gray modules built of portable slabs. When we sit down, we are meant to be useful as individuals. And few of us have factory jobs, and even there we are likely to be operating an individual workstation, interacting with a computer, not another worker. I played on the street, just another kid among the half a hundred who lived on our block. I stepped outside our row house and surveyed the gangs to look for my pals. My older brother had a different group of pals, and the girls had their little packs. But the street was everyone’s, the place we shared, where we came together to play. A computer game can be played without playmates. At the dinner table, each of us can use our smart phones.We entertain ourselves alone by listening to songs of our choosing through personal earpieces. We stream the shows that we alone want to watch and view them on our personal phones, televisions, and computers. We go to fewer concerts every year, and movie theatres may soon be obsolete. You can have food brought to your door, order your clothing from Amazon. Why go out? We must prefer it this way, else we wouldn’t keep building suburbs, buying the electronic gadgets and the cars. I guess we crave personal space. But if we don’t routinely share spaces with others, it has to affect our sense of self and how we understand our place in the community, our sense of common humanity. Technology is just a fancy word for tools. From the beginning, since our hominid ancestors used sticks to scratch their backs, we make tools to enhance our individual capabilities. Every new technological advance enhances our individual power more precisely But, ultimately, as our capabilities are enhanced, we need others less and less. Where will it end?